RiverWinds is an active adult community that welcomes residents aged 55 and better. The community, set in West Deptford, New Jersey, is conveniently close to Philadelphia and all of its exciting attractions. World-class amenities, abundant outdoor recreation and a finely crafted lifestyle has made RiverWinds a hit with active adults. Residents enjoy living in low-maintenance homes because it allows them to live life to the fullest within the community. RiverWinds offers an environment where it's easy to meet new friends and neighbors who share the same interests and hobbies. Although there is no clubhouse inside of RiverWinds, there is a community center open to all ages adjacent to the community that residents can use. This 112,000 square-foot RiverWinds Community Center offers bountiful amenities both inside and out. Residents can work out in the state-of-the-art fitness center, run on the indoor walking track, utilize the two auditoriums or enjoy the two indoor pools. There are also several hobby and games rooms as well as meeting space. The RiverWinds Community Center also offers an exclusive Senior Center within the facility. The Senior Center has a lounge with fireplace, big-screen TV, billiards, game tables and much more. The RiverWinds Restaurant is the perfect place to please your taste buds while overlooking the Delaware River. Outdoors, RiverWinds Community Center's impressive grounds feature an outdoor swimming pool and patio. There is an outdoor amphitheater that hosts many concerts and outdoor gardens for those with a green thumb. The community center also offers a gazebo, kayak launch and walking and biking trails. To top off the amazing amenities offered, residents also have access to the immaculate 18-hole golf course that offers play for all skill levels. RiverWinds encompasses 355 residences that were constructed from 2001 to 2006. There are a variety of housing styles offered within the community that include 88 condos and 267 single-family homes. The condos offer approximately 1,512 to 1,592 square feet of living space with two bedrooms, two bathrooms and lot parking. Those who seek a little more space will like the single-family homes that offer 1,113 to around 2,500 square feet. These homes feature one to three bedrooms, one-and-a-half to three bathrooms and an attached garage. Residents have more time to spend with family and friends due to the great low-maintenance lifestyle offered at RiverWinds. An association fee covers general maintenance of the community grounds as well as lawn care in the summer, snow removal in the winter and trash pickup year round. This allows residents to forget those tedious tasks and focus on relaxing. Residents can partake in exciting events and activities such arts and crafts, billiards, card games, swimming, concerts, and much more. Situated in West Deptford, New Jersey, RiverWinds is surrounded by great opportunities for entertainment and recreation. The community is conveniently located near Interstates 295, 95 and 76, which makes traveling to New York and Philadelphia a breeze. The Delaware River is just minutes away and provides endless outdoor recreation. Closer to home, residents can enjoy the exciting attractions in Gloucester County. The surrounding areas have much to offer including farmers markets, antique shops, restaurants and both public and private golf courses. Homeowners enjoy living at RiverWinds with a desirable location that is close to shopping, restaurants, recreational facilities and major highways. RiverWinds Community Center is located adjacent to the community and offers many desirable amenities. Although it is open to all ages there is a designated senior center within it. RiverWinds Community Center - 112,000 Sq. Ft. There are plenty of activities available in RiverWinds. Here is a sample of some of the clubs, activities and classes offered here. 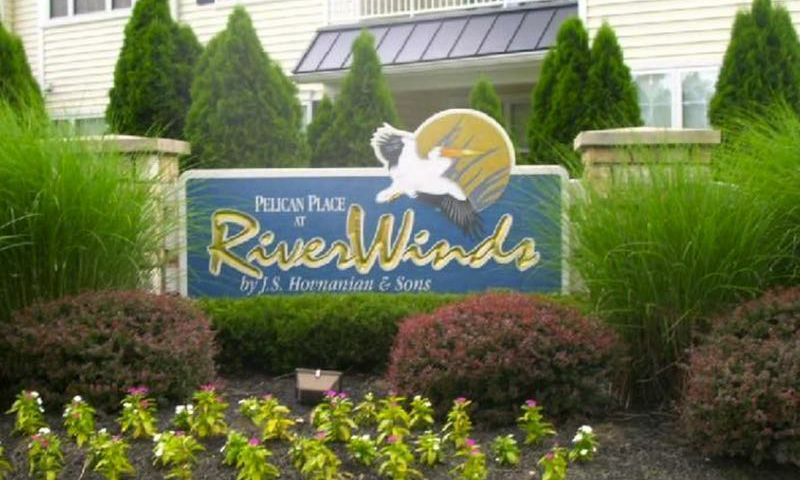 There are 88 condo units within RiverWinds also known as Pelican Place at RiverWinds. These condos offer approximately 1,512 to 1,592 square feet of living space with two bedrooms, two bathrooms and lot parking. Please Note: Floor plans are not available at this time. There are 267 single-family homes within RiverWinds also referred to as Reserve at RiverWinds. Those who seek a little more space will like the single-family homes that offer 1,113 to around 2,500 square feet. These homes feature one to three bedrooms, one-and-a-half to three bathrooms and an attached garage. Please Note: Not all floor plans are available at this time. RiverWinds is affordable and offers a great location. We're both Philadelphia born and raised so we love the area and have tons of family and friends nearby. The community center is very nice and we've met some great people there too. The fitness center is really nice and we use the indoor track and pools a lot too. The senior center always has something going on, although I wouldn't consider it a "senior" center! Between the community center and the surrounding areas there is a lot to do, if you want to be active that is. Even though we've lived in the area for years, we still manage to discover cute new shops and great restaurants! 55places.com is not affiliated with the developer(s) or homeowners association of RiverWinds. The information you submit is distributed to a 55places.com Partner Agent, who is a licensed real estate agent. The information regarding RiverWinds has not been verified or approved by the developer or homeowners association. Please verify all information prior to purchasing. 55places.com is not responsible for any errors regarding the information displayed on this website.